Affected with Pakistan sponsored Terrorism, Kashmir valley of India's Jammu and Kashmir state has witnessed double number of births annually since Census 2001. Fertility Tables published by Census 2011 indicate that there were 85,157 live births in the Valley in the year preceding Census 2001, that number has risen to 1,76,673 in 2011. "This abrupt rise is restricted only to births in the Valley. In Jammu region, number of births has increased by only 19.3 percent, which is somewhat less than the rise in population of that region. In Ladakh number of births has declined by nearly a third," according to an analysis report released by Chennai based Centre for Policy Studies on Tuesday. According to analysis, "While Total Fertility Rates (TFR) is declining everywhere else, TFR of Muslim women in the valley have increased from 2.6 to 3.9. This means that an average woman in the valley today can now expect to have 1.3 extra children in her lifetime." 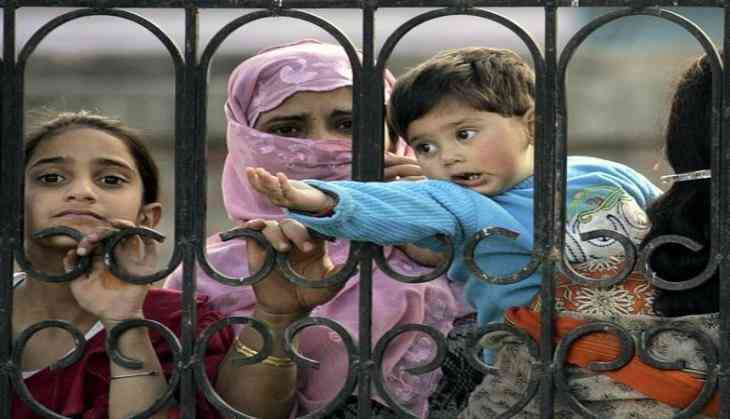 Explaining how total number of births in Kashmir Valley has more than doubled in just a decade, Dr. J K Bajaj, Director, Centre for Policy Studies, Chennai, said, "Such drastic changes in fertility cannot be spontaneous. This can happen only when there is a conscious and concerted effort to encourage women to have more children. This would also require some organised effort by the community to support larger families, especially among poorer people. That is why I wonder whether these unusual numbers point towards another front of the ongoing proxy war in the valley." Of the children born in the valley 99.13 percent are Muslim. The spurt in live births in Jammu and Kashmir is thus limited to the Muslims in the Valley. The rise is such that an average Muslim woman in the Valley can now expect to produce 1.34 extra children over her lifetime compared to what she could have expected in 2001, according to the report. "Such a drastic change in the fertility rates over a period of just one decade is indeed surprising. If this has been happening in the valley, how come nobody knows about it? How come the media and the relevant government agencies are not able to get any information about it? The Census information itself has been in the public domain for about a year. Nobody has bothered to put the data together. I shall personally like to see media reports from the valley describing how this large effort is being run and sustained," said Dr. Bajaj, while talking to ANI exclusively over phone from Chennai. TFR of Hindus in the state, on the other hand, has declined from 2.18 to 2.02. TFR of 2.1 is considered to be the replacement rate sufficient to keep a population stable. Below that rate, populations begin to contract. Demographically, Jammu & Kashmir is now in a situation, where the population of Hindus is likely to contract, while that of Muslims is likely to rise much faster than what could have been expected in 2001. TFR of Hindus in Jammu region has declined from 2.19 to 2.03, which is below the replacement rate of 2.1. Interestingly, TFR of Muslims in Jammu has also declined considerably from 3.45 to 2.88. The rise in the TFR is thus almost exclusively for Muslims in the Valley as we see below. "Higher growth of the population of valley as compared to Jammu region has always been an issue of concern for the Jammu people. But this doubling of births in Kashmir valley between 2011 and 2001 is going to completely disrupt the demographic balance between the two regions," said Dr. Bajaj. Census provides one more measure of fertility: number of children in the 0-6 year age group per hundred of the population of different communities. This measure also confirms the sudden rise of fertility in the Muslim community of the Valley. Census 2001 counted 14.64 children per hundred of population among them, the ratio in 2011 is 17.83. Thus, compared to 2001, there are 3.2 more children per hundred of the population among Muslims there. Number of children per hundred of the population in the state has increased from 14.65 in 2001 to 16.10 in 2011. This rise is also entirely among Muslims. Number of children among the Hindus has declined from 13.30 to 12.04 per hundred. Among Muslims, on the other hand, the ratio has increased from 15.43 to 18.04 per hundred. There are thus 2.6 extra children per hundred of the Muslim population of the state. "There has obviously been a great spurt in the fertility of Muslims in the Valley. Such a drastic rise in the fertility measures is unlikely to happen spontaneously. The numbers do indicate a systematic, concerted and successful effort among the Muslims of the Valley to have more children. Surprisingly, no indications of such an effort have emerged in the public domain," said Dr. Bajaj. It needs remarking that the number of children per hundred Muslims has increased, though only slightly, in Jammu region also. Of the three regions, the number of children per hundred was the highest in Jammu in 2001. For the region, the ratio now is considerably below that of the Valley. But Muslims in Jammu still have the highest number of children per hundred. The ratio for them is 19.02 compared to 17.83 for the Muslims in the Valley. Number of annual births in Jammu and Kashmir has increased from 1.68 lakh in 2001 to 2.74 lakh in 2011. This spurt in births is almost entirely among Muslims. Number of Muslim births has increased by 84 percent, from 1.16 lakh to 2.14 lakh. Number of Hindu births, on the other hand, has increased by just 17 percent, from 47.6 to 55.6 thousand. This rise in Hindu births is somewhat lower than the rise in their population. The spurt in births is confined entirely to the Valley. In Jammu region, the number of births has increased by just 19 percent, and in Ladakh it has declined by nearly a third. In the Valley, however, number of births has more than doubled, from 85 thousand in 2001 to 1.77 lakh in 2011. Of the children born in the Valley more than 99 percent are Muslim. The spurt in births is a phenomenon confined to the Muslim community in the Valley. The TFR of Valley Muslims has increased from 2.54 to 3.88. An average Muslim woman in the Valley today is likely to have 1.34 extra children over her lifetime as compared to what she could have expected in 2001. TFR of Hindus in Jammu and in the State as a whole has declined and is now below the replacement level of 2.1. The population of Muslims, especially in the Valley, is entering a phase of sharp expansion, while that of Hindus is likely to begin contracting. The phenomenon of a sudden spurt in Muslim fertility is further confirmed by the rise in the number of children of 0-6 year age in the Muslim population of the Valley. The number was 14.64 per hundred in 2001; it has risen to 17.83 in 2011. Thus there are more than three extra children for every hundred Muslims in the Valley. The number of children per hundred Hindus, on the other hand, has shrunken in the state and in all three regions of the state. "If the data were to be believed, it would seem that Muslims in the valley are making a conscious, concerted and successful effort to increase the number of children among them," said Dr Bajaj in his concluding remarks.